Inland waterways are now frequently being discussed as an issue under the overall theme of water and water resources. This is confirmed at the upcoming 7th World Water Forum, to take place in Daegu, Korea, April 12-17, 2015. 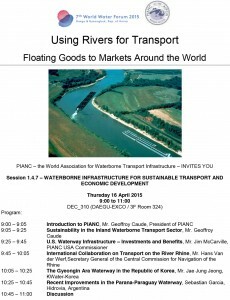 On April 16, 2015 a PIANC Side Event is scheduled on ‘Water Infrastructure for Sustainable Transport and Economic Development’. The flyer containing the programme of this event has a striking aerial view of a big push-tow negotiating tight bends on the Ohio River. Using waterways to transport goods and people contributes directly to both economic development and sustainability. The following text Improvements in rivers to support year-round navigation have opened up regions, stimulated economic development, and connected people and their goods with the markets of the world, thus contributing to the Millennium goal of reducing poverty . Inland waterborne transports inherent efficiency also translates to lower energy use and lower emissions for each ton transported, as compared to other modes, thus advancing environmental sustainability. Moving more goods on water also can reduce congestion on alternate modes. 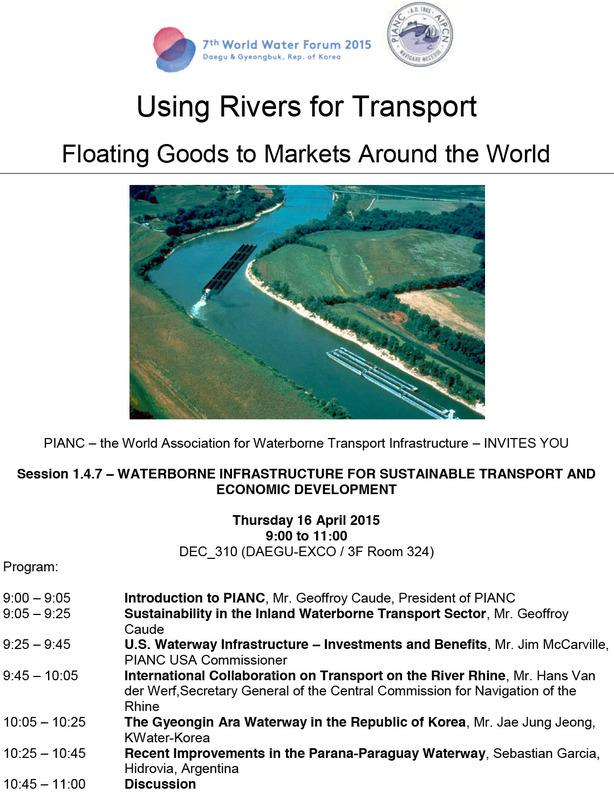 This session will show how inland waterborne transport is advanced and improved by the international technical collaboration led by PIANC, the World Association for Waterborne Transport Infrastructure. Globalization is driving increased trade and the need to use rivers to connect the hinterland, and even land-locked countries, to seaports. The stakeholders in river navigation around the world face similar problems, including safety, accident prevention, and protection of the environment. More pooling of knowledge and experience, and the creation of a global framework for analysis and thought, as can be done at the World Water Forum, would make it possible to further promote and advance the environmentally-friendly dimension of this very important water use, water for transport. 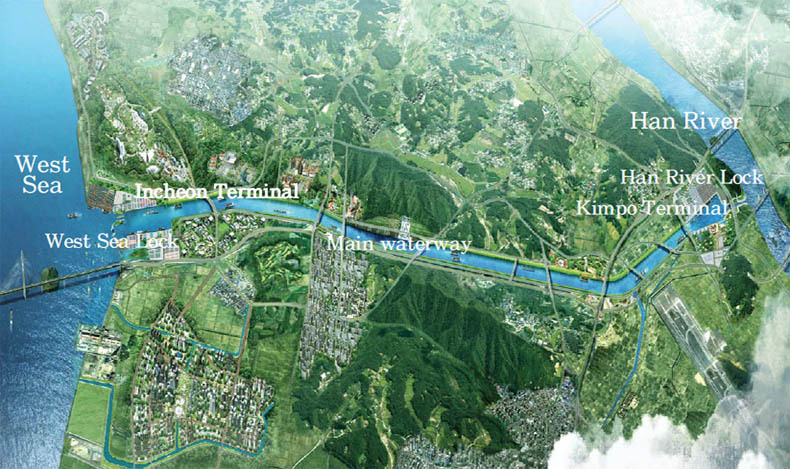 South Korea will soon be celebrating completion of the 19km long Gyeong-In Waterway from the river Han west of the capital Seoul to the Western Sea just north of the port of Incheon. The canal has been in operation for nearly a year, but we have just heard that the official opening ceremony and related events have been programmed for Friday May 25. The canal is 80m wide and has a navigable draught of 6.20m, sufficient for container ships carrying 250 TEU. This is a multi-purpose project, which will also provide flood relief in the river Gulpo catchment area, as shown by the diagram. 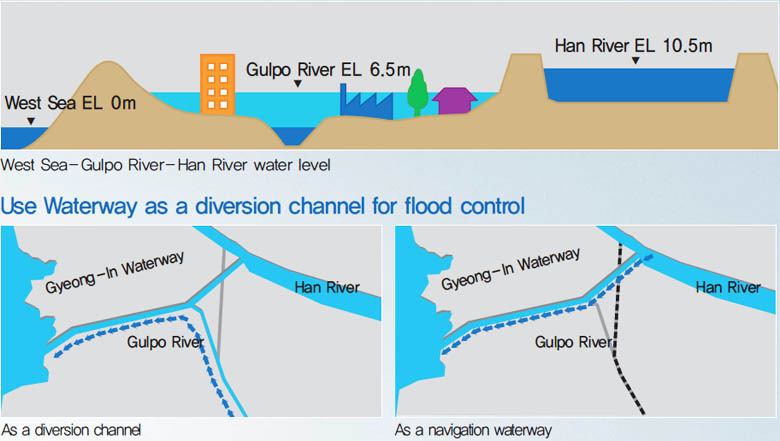 These images are part of a detailed presentation of the waterway by Korea Water.